Skip-the-line timeslot tickets for the Louvre Museum are best bought online. 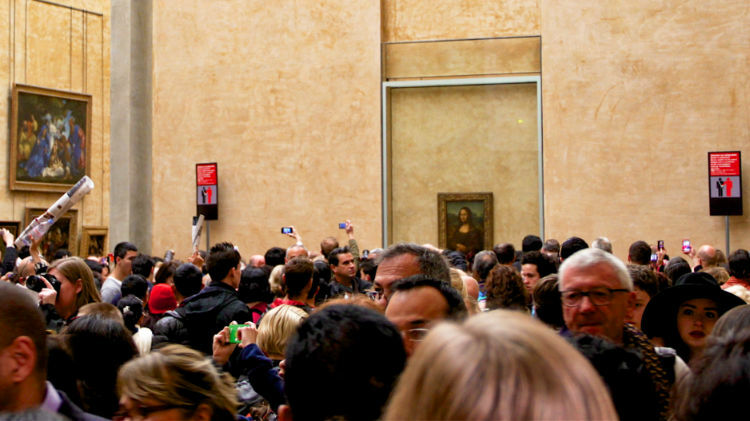 Guided tours also give fast-track admission to the Mona Lisa. Specific time-slot, skip-the-line tickets are the only sensible way to visit Louvre Museum in Paris. 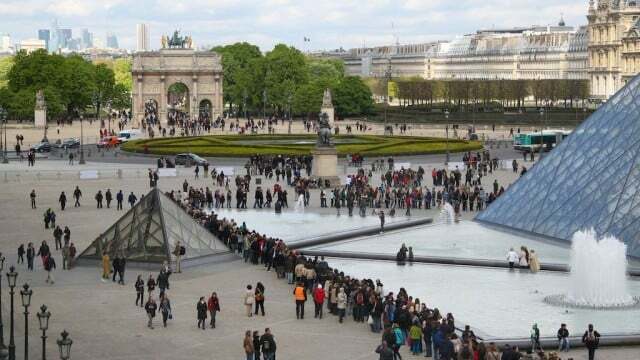 Lines at the Louvre are notoriously long making the small surcharge for these online fast-track tickets a very good bargain and timesaving deal. Guided tours are the fastest way to enter the Louvre Museum. The best time to see the Mona Lisa is to visit the Louvre late afternoon. Tickets for the Louvre Museum in Paris are €15 if bought onsite. However, this is generally a bad choice on all but the most quiet of times as visitors without advance tickets are last in line at the notoriously long security checkpoint queues. Spending a little more on advance purchase specific time-slot tickets could save hours of queuing. All visitors on the first Sunday of the month from October to April and on 14 July. Specific time-slot tickets for the Louvre Museum that allow visitors to skip-the-line is the only sensible way to visit the museum. During holiday periods and weekends these tickets are almost essential and even on a quiet day it is a very small surcharge for the assurance of not having to wait in queues. These tickets give visitors priority at the security checkpoints within a specific half-hour period and thereafter direct admission to the galleries. The cheapest time-slot skip-the-line tickets for the Louvre Museum are directly from the museum website for €17. Furthermore, this seems to be the only skip-the-line option that allow for early morning reservations. However, rather infuriating, this ticket is a true [email protected] ticket: it must be printed on a sheet of A4 paper. It is not valid as a show-on-phone ticket and it is not possible to print or collect a ticket at the museum. This ticket is the best option for those planning ahead but it is unfortunately not a realistic option to simply buy when lines are long. Skip-the-line tickets for the Louvre are also available from a variety of resellers such as Tiqets and Get Your Guide. These resellers allow tickets to be shown simply on the phone (or printed if preferred), which is great for buying tickets when already traveling and without access to a printer. These Louvre Museum time-slot tickets generally sell for around €20. Avoid resellers that require vouchers to be exchanged for paper tickets at a nearby shop or office – these add hassle rather than convenience. Similarly, the official audio guide is available for anyone for rent at the museum (€5), or even better, download a guide before visiting – many are available online ranging from free with good visiting tips to premium guides by art experts. 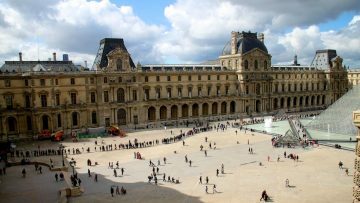 Guided tours give the fastest admission to the Louvre Museum – see more details below. The Louvre Museum in Paris is open Wednesday to Monday from 9:00 to 18:00, closing at 21:45 on Wednesday and Friday. The Louvre is closed on Tuesday, 1 January, 1 May and 25 December. The best times to see the Louvre are Wednesday evening (or Friday for those qualifying for free tickets) or weekdays after 15:00. See the Mona Lisa last – rooms start to close from half an hour before closing. A good time to visit the Louvre is first thing in the morning on weekdays – be in queue at 8:45 rather than 9:30 – and see the Mona Lisa (and other top sights) first. The worst time to see the Louvre Museum is any day when admission is free, most weekends (especially long weekends), school vacations, July and August. 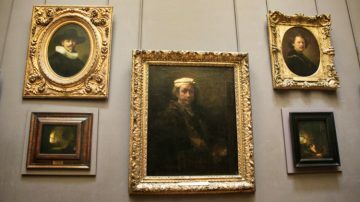 No one can see all of the Louvre in a day – even on the busiest day, once past the security line and the scrum at the Mona Lisa, many of the rooms further away from the most famous art will be surprisingly quiet and very easy to enjoy in peace. The main entrance to the Louvre Museum is via the large glass pyramid in the central courtyard. It is also possible to enter the Louvre Museum via the underground La Galerie du Carrousel shopping center – queues here are often shorter. Other entrances – Passage Richelieu and Porte des Lions are no longer available for individual travelers. Blue – visitors needing assistance, e.g. disabled, infirm, pregnant. Green – visitors with specific time-slot tickets. Orange – visitors with tickets, Paris Museum Pass. Yellow – visitors without tickets. Visitors qualifying for free tickets should wait in the yellow line but may join the other queues if traveling with someone with a paying ticket. Time-slot tickets are valid for the whole calendar day. If a timeslot is missed, join the orange queue – if very long, try your luck at the green queue first! The quickest way to enter the Louvre Museum is as part of a guided tour. A huge variety of tours are available and in same cases may even be booked on the day of the tour itself. A short 2-hour highlights tour (or even a 90-minute express tour) is a good way to enter the museum fast and to see the top famous works. At the end of the tour, visitors may of course stay in the museum until closing time. Longer 3-hour tours are hardly more expensive than the highlights tours and is a better option for visitors less interested in staying behind to explore further on their own (although you may of course remain in the museum). Specialized tours with art experts are generally worth the price. A very appealing option is late afternoon or evening tours that see the Mona Lisa last – the changes of successfully seeing the Mona Lisa without crowds late afternoon is much better than even early morning. Small groups and private tours cost more but are generally more pleasant and a better option for visitors that may struggle with stairs. Private tours for families (90 minutes / 2 hours) are also a great option when traveling with children. There is even a special Egyptian Art private family tour. Some “tours” provide little more than an accompanied walk through security and a fast-track shortcut to the Mona Lisa. These add very little value – rather take a proper guided tour, or do it alone. The Mona Lisa room is going to be crowded anyway. Tours not offering fast-track admission, or meeting inside the museum, are also saving at the wrong end. Combining a guided tour of the Louvre Museum with longer Paris day tours and other sights may be a good money saving deal and a good option for travelers with limited time. However, read the fine print – some “tours” offer little more than the tickets and a map. Popular combination tours recommended by Get Your Guide include for example with the Eiffel Tower and Seine River cruise, Musée d’Orsay (or private tour with Orsay), Notre-Dame Cathedral, Wine tasting, or the Palace of Versailles to include two top Paris sights in a full day tour. Seeing the Louvre is also possible on a day trip from London (or better two-day overnight trip) using the Eurostar trains.